NEW YORK -- New York City police are searching for an attacker in a possible anti-gay hate crime that was caught on video. The male suspect can be seen in the video, which was recorded on Tuesday night in a Dallas BBQ restaurant, pushing Jonathan Snipes to the ground and kicking him. Then, after Snipes' partner pulls him away, the suspect can be seen raising a wooden chair and slamming the men with it. Snipes slumps in a chair, while the other man collapses to the floor. The suspect allegedly shouted anti-gay slurs before the attack. Police said the suspect, seen on video with a beard and wearing a suit, is about 35-years-old and could be as tall as 6-foot-4. CBS New York spoke with the alleged victim, Snipes, after he met with detectives from the NYPD Hate Crimes Unit. He said a dinner date was underway when the suspect, who was sitting at another table, made an anti-gay slur after a drink spilled. "We haven't been able to sleep yet because of the head injury that was sustained (by me)," Snipes said. "Any violent act against any New Yorker I would not condone, but especially anything that's protected - whether it's your race, your religion or your creed," Snipes said. 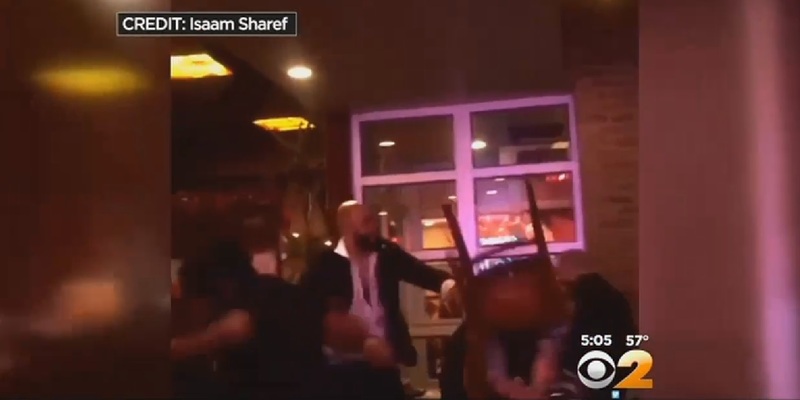 Witness Isaam Sharef, who shot the video, told radio station WCBS that Snipes initially made things physical, but said the other man escalated the confrontation. "In all my years, I had never seen anything like that. I had never seen somebody crack -- I mean like, you could hear the wood break; like, that heavy, thick wood upside that man's head," Sharef said.